Building Confidence One Swing at a Time. You can help. Your donations will rebuild the lives of our combat-injured troops and families through golf. 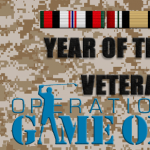 Operation Game On is continuing our efforts and still needs your help so we can continue to be there for them! Leave no one behind sounds cliche, but it’s just as important now as it is on the battlefield. Golf reminds us to focus on the positive and overcome adversity. Some of our troops take a moment here to share what golf now means to them as they strive to regain confidence, balance, mobility and a positive attitude. Provide golf as a form of rehabilitation for our returning combat-injured troops suffering from physical and mental disabilities. The troops' doctors regularly advise some of their patients to try our program. Golf is good for the mind and for the body. It allows them to compete, laugh, relax, focus, and challenge their muscles outside of regular PT. It gives them hope of a clearer future after their tragic injuries and experiences of war. It's only through your donations that we can accomplish our mission. Our goal is to reach out to our troops and their families to show them the honor they deserve through an introduction to the game of golf. Golf gives them a chance to compete and be active. It's a fun wholesome and challenging outdoor activity. Golf helps build self confidence and teaches determination and there's also no better place to create new friendships like the golf course. We have several ongoing programs and events as well as our annual golf tournament. We are busy making plans for the 2013 Golf Classic and other fundraisers. Stay Tuned! We work in partnership with the Naval Medical Center San Diego and Wounded Warrior Battalion West, Camp Pendleton, to equip and instruct 100s of injured troops, and their wives. It's golf as a form of mental, emotional and physical therapy. © 2019 Operation Game On!